Today, I did what any sane person who just DNFed for the first time would do: I registered for another race. As Jesse and I were talking last night, I realized trying to PR at the Town’s Half in three weeks could be done but is probably not very smart. 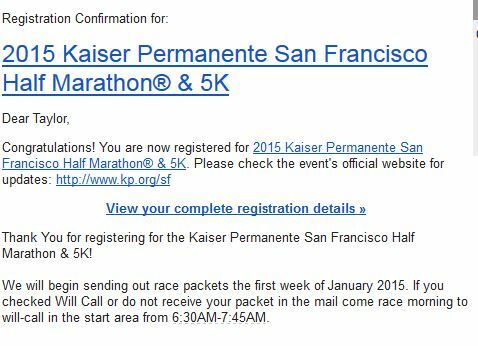 Instead, Jesse and I are both planning for a PR at the Kaiser Half Marathon in San Francisco on February 1. This race was actually my second race (and half marathon) ever back in 2011, where I was on track for a sub-2 hour finish until IT band pain (sound familiar?) derailed my pace for the last five miles. This PR-friendly course is net downhill and takes place in Golden Gate Park, with segments in NOPA and Ocean Beach. I squeaked out a sub-2 hour finish at the Healdsburg Half in October, despite two bathroom stops and almost no sleep; I know I can improve my time on this course. The timing of this race works perfectly. After North Face in December, I can dial back on mileage and focus on speed. With the Berlin Marathon in September 2015, I want to abide by a proper 16-week training schedule with no shortcuts, which would schedule training to begin in May. The race is $60 – not a bad price compared to other races in San Francisco. Last year it rained, so hopefully the weather will cooperate for us! Yay for jumping right back in! Yay indeed! I’m excited for this one. So sorry to hear you DNF’d, but proud of you for not letting it get you down and getting right back out there! Rest up! Hmmmm, you better take care of yourself! Get yo’self healthy! Good luck!!! You have some nice races planned! Make sure you heal up real good before you start training again!! Good luck, sounds like a great race! That’s the spirit!! SO many more races for you to run! 🙂 And you have plenty of time to heal up and have a successful training camp for this race! Thank you! and yes, so many more races to run! We’re lucky to live in SF. Good luck with you journey to a new PR. I’ve been warned about the post-race euphoria and signing up for more races immediately after, whether good results or bad..hope it all works out for you. My wife (RunningBostonandBeyond) is currently training for her redemption run in January for Boston. Again, good luck!